Ambulatory surgery is defined as surgical and diagnostic intervention that does not require overnight hospital stay. The ambulatory surgery has been increasingly adopted by patient population in Europe owing to its safe, high quality, cost-effective and time saving approach to perform surgical interventions. In addition, advancements in technologies that enables healthcare professionals to perform multiple minimally invasive surgical procedures in a single day further drives the market growth in Europe. For example, advent of minimally invasive surgeries such as laparoscopic procedures has permitted complex surgeries such as gallbladder, hysterectomy surgeries to be done in reduced amount of time. However, factors such as lack of adequate medical facilities and favorable reimbursement policies for inpatient surgeries as compared to outpatient surgeries might impede the growth of Europe ambulatory surgical and emergency center services market. In 2013, the orthopedic surgeries segment accounted for the largest share. Dominance of this market segment was majorly due to high cost of procedures coupled with rising prevalence of arthroscopic procedures. The ophthalmology surgeries segment is expected to grow at the highest growth rate during the forecast period from 2014 to 2020. Factors such as rising number of ophthalmology procedures performed and increasing number of cataract, diabetic retinopathy and other ophthalmology surgeries are supporting the growth of this market segment in the European region. In terms of market volume, ophthalmology segment recorded the highest number of ambulatory procedures and is expected to dominate the market in future. Growing number of ophthalmology procedures that can be done on a daily basis coupled with advancement in ophthalmology ambulatory surgical procedures will help this segment to record high revenue. Moreover, orthopedic surgeries recorded second highest number of ambulatory procedures in 2013. The growth of this segment is due to persistent rise in geriatric population coupled with growing trend of minimally invasive surgeries that helps large number of orthopedic surgeries to be done on ambulatory basis. U.K. dominated the Europe ambulatory surgical and emergency center services market in 2013. The dominance of this region was mainly attributed to rising government and medical professional bodies’ initiatives to promote ambulatory services in the country. For instance, in November 2014, the British Association of Day Surgery in collaboration with the Healthcare Conferences UK (HCUK) organized an event titled “Improving Quality in Day Surgery”. This event aims at discussing new way to improve quality of day surgery in European countries such as the U.K. and Germany. Rest of the Europe (RoE) accounted for the highest number of ambulatory surgeries performed in 2013 and is projected to dominate the market during the forecast period from 2014 to 2020. Rising number of day surgeries performed in countries such as Denmark, Netherlands, Sweden and other regions will help Rest of Europe to record high number of ambulatory surgeries. Some of the key players having presence in the Europe Ambulatory Surgical and Emergency Center market are Community Health Systems, Inc., IntegraMed America, Inc., Nueterra Healthcare, Terveystalo Healthcare Oyj, Symbion, Inc., AmSurg Corporation, Medical Facilities Corporation, Surgery Partners, Healthway Medical Corporation Ltd., Eifelhoehen-Klinik AG and others. Among these players, companies such as Community Health Systems, Inc., Healthway Medical Corporation Ltd. and Medical Facilities Corporation have the presence in majority of ambulatory surgeries. The market for ambulatory surgical and emergency center services is constantly expanding because of several favorable elements aiding its advancement. Ambulatory surgery center or ASC is a modern healthcare facility wherein diagnostic and preventive procedures do not require patients to stay hospitalized for more than a day. Types of procedure and geography are the two major areas of segmentation in the Europe ambulatory surgical and emergency center services market. These have been discussed in detail, where trends, opportunities, and forecasts are supported by statistical findings. An estimated forecast of market trends and opportunities from 2014 to 2020 is talked about, both in terms of volume and revenue. The report not only sheds light on factors such as competitive rivalry, threat of new substitutes, and market attractiveness, but also discusses favorable government initiatives, service portfolios of key players, and their business strategies. The market is analyzed country-wise, wherein the U.K., Germany, Italy, France, Belgium, Spain, and the Rest of Europe are discussed. Porter’s Five Force Analysis is applied to the gauge various trends in the market, along with a compilation of primary and secondary research sources. 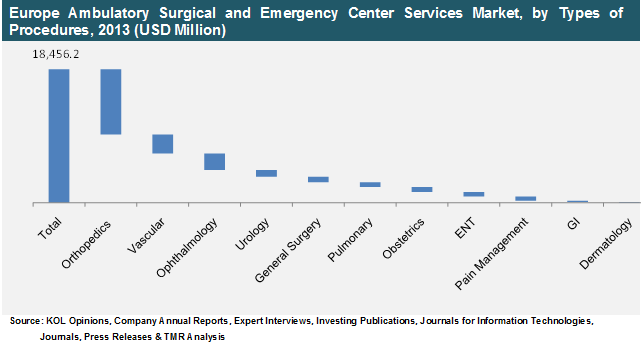 According to the findings of Transparency Market Research (TMR), by the end of 2020, the Europe ambulatory surgical and emergency center services market will be estimated at US$42.8 bn. An increasing number of patients suffering from cataract, diabetic retinopathy, and other eye-related diseases, together with more ophthalmology procedures have been fuelling the market in Europe. The U.K. dominated the ambulatory surgical and emergency center services market in Europe in 2013. According to types of procedure, the market is segmented into ophthalmology, gastrointestinal, dermatology, orthopedics, urology, pulmonary, pain management, vascular, general surgery, and ear, nose and throat (ENT). Experts proclaim that the ophthalmology segment will witness great demand from 2014 to 2020, yielding high amounts of profit. Increasing geriatric population, minimally invasive surgical methods, and the growing frequency of diseases such as diabetic retinopathy and cataract are factors driving this segment. The orthopedic segment also accounts for a significant share in the profit due to increasing incidence of orthopedic emergencies among the aged. Absence of basic healthcare and medical facilities in emerging economies and unfavorable reimbursement policies for inpatient surgeries have been identified as the challenges faced by this market. Geographically, the market is segmented into the U.K., Spain, France, Germany, Italy, Belgium, and the Rest of Europe. The U.K. dominated the ambulatory surgical and emergency center services market in the past. Countries in the Rest of the Europe segment display a greater degree of potential during the forecast period 2014 to 2020. Each day, a growing number of surgeries are conducted in the Netherlands, Sweden, Denmark, and other regions. IntegraMed America, Inc., Community Health Systems, Inc., Terveystalo Healthcare Oyg, Nueterra Healthcare, Symbion, Inc., Surgery Partners, Eifelhoehen-Klinik AG, Medical Facilities Corporation, and Healthway Medical Corporation Ltd. are some of the major players in the market for ambulatory surgical and emergency center services. These companies have been focusing on expanding their client pool and gaining a place in the global market.